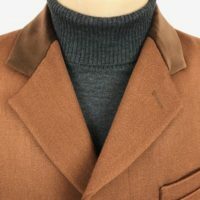 Late ’60’s style coat in the best quality heavyweight cotton moleskin fabric. 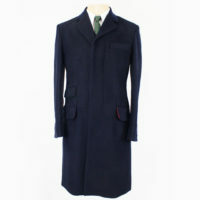 Made in England by Jump the Gun; fully lined with one inside pocket. I prefer early 60’s clothing so this is not the sort of coat I’d normally go for. However, I tried this on in the shop and was completely smitten. Absolutely love it. Stunning! Hi John, thanks for the comments. Yes, it's definitely a late 60's style and quite out of keeping with our usual early '60's vibe. People love them though, and we have them made locally,. so it would seem a shame to stop! Hi John, thanks for the comments. Yes, it’s definitely a late 60’s style and quite out of keeping with our usual early ’60’s vibe. People love them though, and we have them made locally,. so it would seem a shame to stop! Bought this coat online after seeing it in the shop and love it. 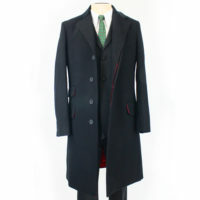 really is a stand out from the crowd coat !! Glad you like it. Thanks for letting us know. Love this coat and if you want to stand out and be noticed then look no further. Had this at least a year now and it still looks great.